On 18 November, H.E. 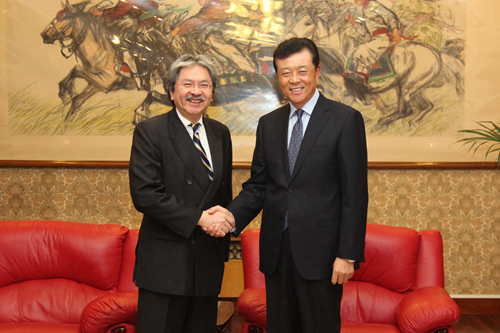 Ambassador Liu Xiaoming met with the visiting Financial Secretary of Hong Kong SAR Government John Tsang Chun-wah and his delegation in the Chinese Embassy. Ambassador Liu welcomed Financial Secretary John Tsang Chun-wah on his visit to the UK and briefed him on the current developments of China-UK relations. Ambassador Liu appreciated the Financial Secretary Tsang's high evaluation of the significance of the Third Plenary Session of the 18th Communist Party of China Central Committee and pointed out that the major decisions made by the Third Plenary Session will not only give a strong boost to China's development and progress but also bring more opportunities for the development of China-UK relations. Ambassador Liu applauded the positive role that Hong Kong has played in China-UK relations since Hong Kong's return to the motherland in 1997 and expressed his hope that Hong Kong will continue to work as a bridge and link for trade and economic cooperation between China and the UK. He also introduced the long-standing efforts made by the Chinese Embassy in safeguarding the rights and interests of Hong Kong compatriots in the UK and said the Embassy will continue to provide quality and efficient consular protection and services to Hong Kong compatriots. Financial Secretary Tsang expressed his thanks to the Chinese Embassy for its continued support of Hong Kong's exchanges and cooperation with the UK and protecting the rights and interests of Hong Kong compatriots in the UK. He said Hong Kong's economic growth has long benefited from sustained and rapid economic development of China, and now the Third Plenary Session of the 18th CPC Central Committee has made an overall plan to deepen the reform in a comprehensive manner. This will present new opportunities for the development of Hong Kong. He said the purpose of his visit is to promote pragmatic cooperation between Hong Kong and the UK and further enhance the "super-link" role of Hong Kong in China-UK relations.